Seizures are actually incidental circumstances occurring due to mental and brain complications. An unexpected and hasty electrical activity is generated in the brain which causes seizures in boxer dog brain. It can be sometimes causing convulsions as well but not in all cases. Seizures can be further categorized into two kinds, focal seizures which are also called partial seizures, and they affect one side of the brain. The other form is known as ‘Generalized seizures’ which are actually result of unusual activities being emerged on both sides of the brain. If we say, seizures are not actually a disease but these are in fact the syndromes of a particular mental sickness, it might not be wrong. If you feel your handsome chap is suddenly pretending in behaving surprising and unusual ways even in its unconscious manners, like he is falling limply on the floor or apparently seeming as squashing in water, unfortunately he’s caught by seizures. 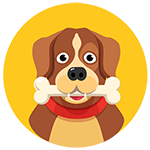 Normally, the duration of seizures in a dog may last during 1-2 minutes in which the dog may display the mental disorders. The seizures disorders are also known as Epilepsy in which a dog is affected from uncontrollable electrical shocks in its brain. A seizures disorder in a boxer dog might outcome as shattering of body, jerking and jiggling of muscles, loss of sensibility, salivating and chewing its tongue or bubbles coming from its mouth. A boxer dog if caught with seizures can fall to its side and start boating movements by its legs. 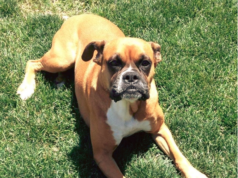 Even urination sometimes becomes uncontrollable during seizures in a boxer dog. 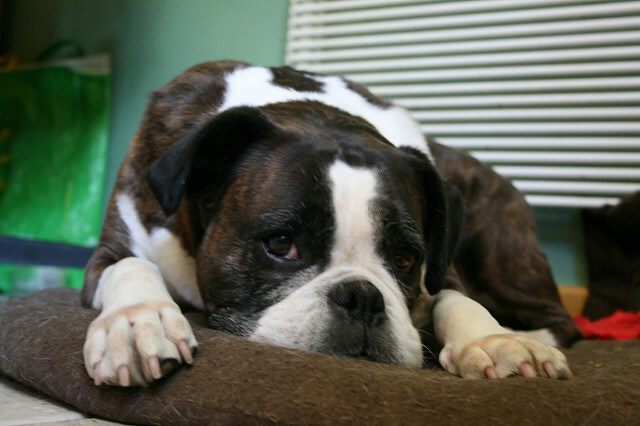 Seizure might cause rickety, unbalanced or temporarily blind conditions in a boxer dog. Such boxer dog will roam round and round and will have collusion with the things. Saliva dropping from its mouth and bleeding from its chin will also be a sign of seizures in a boxer dog. Epilepsy is also certain kind of neurological disorder that causes a boxer dog to react in shape of abrupt and undisciplined sort of seizures. In this case, such affected boxer dog can hold its senses and sometimes go in complete insensibility. But in this type of epileptic seizures, the boxer dog with in-time and suitable medication can sustain a healthy and happy life. 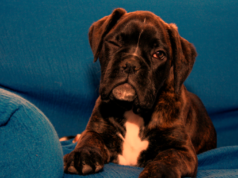 Primary epilepsy appears in the puppyhood of a boxer dog. 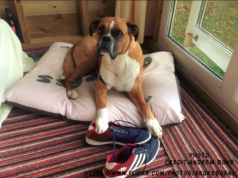 Sometimes a boxer dog in its mid-age can be suspected to develop certain brain tumour which is actually originated from the membranes covering the brain. Boxer dog is a breed which is also prone to the building up of brain tumours particularly in the pituitary gland of the brain. Seizures are normally the results of the existence of such brain tumours in a boxer dog. Degenerative myelopathy can also cause seizures especially in the old-aged boxer dogs which is actually a progressive disease of the spinal cord. In the start, the hind limbs of the boxer dog suffer from the eradication of connectivity. The affected boxer dog will wobble while doing movements especially during walks. There are many types of medications available in the market these days for the treatment of seizures in a boxer dog. Bur 100% cure with medications is still not possible, actually what these medications do? They minimize the re-occurrences of fits or seizures or reduce the severity of such dangers. The most beneficial form of these medications is made by mixing the phenobarbital and potassium bromide. Belladonna medicine is found really effective in phase of seizures to a boxer dog which is given after 15-20 minutes intervals and it is found with real compelling effects. Cocculus 6C is also a good medicine for a boxer dog with shaking syndromes. Aconite is also considered useful which can apprehend the fits or seizures prior to the attack. Actually Seizures and epilepsy are the results of chronic and long standing disease and this makes the choice of remedy really cacophonous. It is also suggested, if a boxer dog is in the phase of getting the treatment for seizures, a constant check and observation is required on such boxer dog by its owner. If it is not controlled, resultantly the livers and other sensitive organs of such boxer dogs can also be damaged. If your boxer dog is suffering from the idiopathic form of seizures, some vets recommend for the acupuncturing sessions of such boxer dog which can be performed on weekly basis. In some cases, of your vet is unable to determine the exact cause of seizures in a boxer dog, he or she might recommend you for making some changes in the routine food of such boxer dog. This is because, sometimes certain food elements can become allergens and create allergy for a boxer dog. It is always good choice for preparing home-cooked stuff for the boxer dog. Some food supplements can also be useful for controlling the seizures in a boxer dog. Omega 3 and Omega 6 are kind of supplements that help in maintaining the skin of a boxer dog healthy and fresh. The logic behind the recommendation of such food supplements is as they reduce the neurological activities so the harms and sequence of seizures in a boxer dog can become manageable somehow. There is a continuous struggle carried on by the dog scientists for the determination of the root causes of seizures in boxer dog. This is a good sign as this might help in future for managing effective control on seizure and epilepsy in boxer dogs. With a balanced food and keeping a constant and eager check on the seizure suspect boxer dog, the dangers of this unpredictable disease can be minimized.